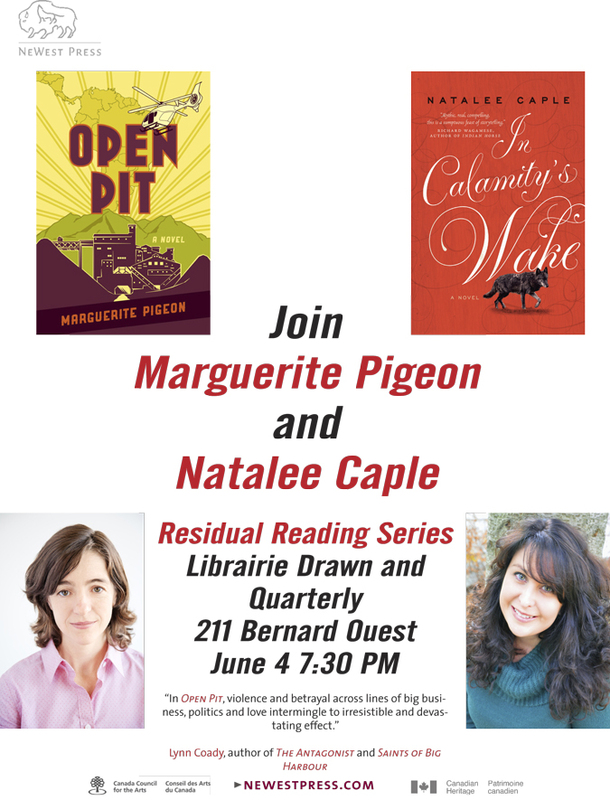 Residual Reading Series is pleased to present a reading of two new works of fiction by Marguerite Pigeon and Natalee Caple. Natalee’s new novel, In Calamity’s Wake, has been described as a cinematic adventure, a dual, or dueling, narrative in two voices that darts between, as Zoe Whittall writes, “mythology, historical accounts, song lyrics, poetry, rumours, and fiction of the time period.” Pigeon’s Open Pit confronts the landscape and the civil rights of indigenous people against the backdrop of big business and amid the chaos of love, relief and difference, resulting in the questioning of what it means to be situated against will. Join us as these two talented and unique writers launch their books together in Montreal. Tonight! 211 Bernard Ouest! 7:30 pm!